On the third and final day of the NFL draft the New England Patriots held 4 draft picks, one at the top of the 4th round and three in the 7th. While the Patriots did not pick 4 players on day 3, they did add 4 players that will be able to compete for a spot on the roster come training camp. After a few trades to start of the 4th round, the Patriots came on the clock with the 5th pick (102nd overall). A lot of people speculated prior to the pick that the Patriots were planning on double-dipping into the wide receiver pool after picking Aaron Dobson in round 1. There were some great names still on the board at the time, Quinton Patton being one of them who I absolutely loved. Instead, however, the Patriots went with Josh Boyce out of Texas Christian. Boyce is a 5’11’ receiver who has some good size but some elite speed. At the combine, Boyce ran a sub-4.4 in the forty, and that was on an injured foot. That injured foot is somewhat of a concern, but most accounts say that he should be ready to go by training camp. That is big, because the Patriots have had problems developing receivers when they have a late start acclimating to their system (see Price, Taylor). The Patriots did not have another pick for about 6 hours but the war room stayed busy during the lull. Just before 3 o’clock Eastern Time, Jeff Howe of the Boston Globe reported that a trade of RB Jeff Demps was “imminent.” Demps of course was the Olympic sprinter that the Patriots signed to a 3-year deal during last training camp before he injured himself in a pre-season game against the Buccaneers. A couple of months ago reports started coming to light that Demps was trying to split his time between football and sprinting, which obviously did not go over well with the coaching staff in Foxboro. 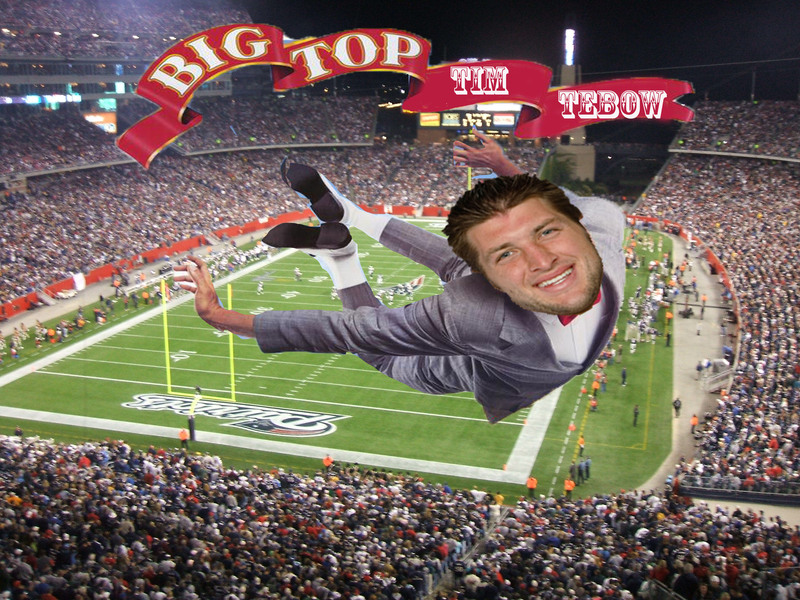 Rumors soon started swirling that the Patriots had put him on the trading block. Some time after the original report from Howe, it was announced that a trade including Demps did indeed happen. It was reported that the Patriots would ship Demps along with the second of their 7th round picks (229 overall) to Tampa Bay in exchange for RB LaGarrette Blount. Tampa is a logical spot for Demps as they were the only other team to see Demps during the their joint-practice with the Patriots after Demps signed with the team. 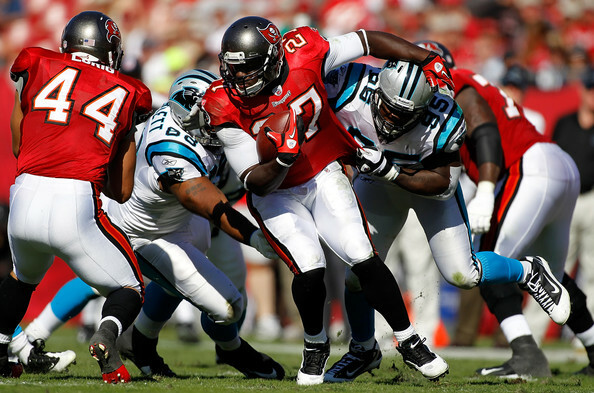 Blount lost a lot of playing time this past year after the meteoric rise of rookie sensation Doug Martin. 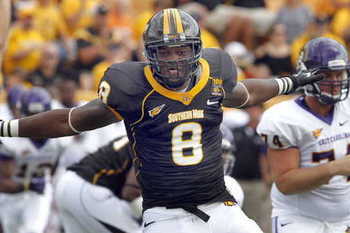 Blount was signed as an undrafted free agent in 2010 after falling out of the draft due to behavior issues at Oregon. He had a phenomenal rookie year, totaling over 1,000 yards, and a solid year in 2011. Blount joins a running back room led by Stevan Ridley, Shane Vereen, and Brandon Bolden. 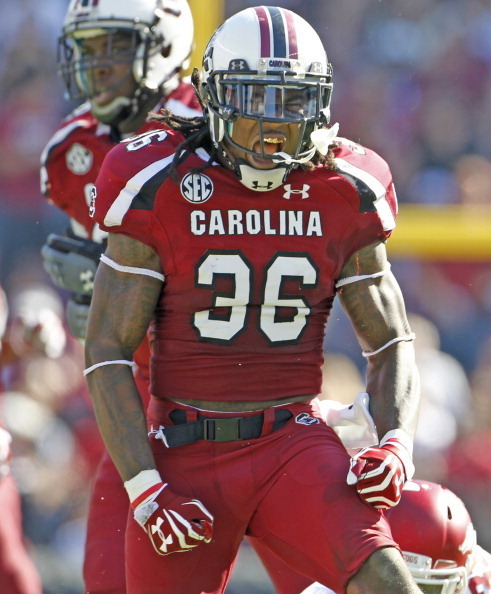 He will probably compete with Bolden for snaps behind Ridley and for a spot in some goalline situations. This may be my favorite move of the entire draft; the Patriots get rid of a player they didn’t want, and get someone that can bring a different edge to their running game. When the 7th and final round came around, the Patriots were left with 2 selections. With the first, they opted to add a little more to the pass rush with Michael Buchanan, a DE out of Illinois. Buchanan was on some pre-season watchlists but had somewhat of a disappointing senior season for the Illini, totaling just 4.5 sacks and 7 tackles for loss. Buchanan is an impressive-looking human being at 6’6” and about 240 pounds. He has long arms as well, which I really like in my pass rushers. Buchanan is a very interesting prospect who I can absolutely see competing for playing time as an edge rusher on passing downs. Buchanan seems like, at least right now, he is just happy to be in New England. “This was a childhood dream of mine with an organization I always wanted to be with, so it’s definitely a great feeling. It’s truly a blessing,” Buchanan said during his conference call. With the Patriots’ final pick, Belichick again used his pipeline in New Jersey and selected Steve Beauharnais, an inside linebacker from Rutgers. It was mostly agreed that this was a good value spot for Beauharnais as he was slated to go in the 6th round. Beauharnais was the team captain for the Scarlet Knights this past year and a finalist for the Butkus award, he also had a career high 83 tackles in 2012. Most scouting reports praised him for his football smarts, saying his called all the signals for the Rutgers’ defensive unit. Aside from even the Rutgers connection, this screams a Belichick pick. He’s a team captain and a smart player that can line up a defense, everything Bill loves in his linebackers. This marks the 2nd time since 2010 that the Patriots picked 3 players from the same school. That year the team picked Brandon Spikes, Jermaine Cunningham, and Aaron Hernandez from the University of Florida. Round 1, Pick 29 – Datone Jones, DE, UCLA Last year the Patriots surprised a lot of people and moved up twice in the first round to get two solid defenders that are poised to be anchors in that defense for the foreseeable future. The defense was improved with those additions as both players made an immediate impact from week 1 (although injuries did slow down Chandler Jones later on in the season). Pass rush is still an issue in New England though, so enter Datone Jones of UCLA. Jones has that size that Bill Belichick likes in his pass rushing defensive linemen and has the versatility that is so valued in Foxboro. Jones has a good burst and can absolutely get after the passer. What makes Jones a logical selection here is his ability to also play the run. Bill would much rather pick a player in the first round who can play on first, second and third down, Jones can do that. He can play with his hand in the dirt and can probably even stand up and play a little bit of linebacker if necessary. The Patriots have a solid contributor on the other side of Chandler Jones with veteran Rob Ninkovich, but the addition of Datone Jones would make that defensive line something to be excited for if you’re a Patriots’ fan. That would make a base 4-man front consisting of Chandler Jones, Tommy Kelly, Vince Wilfork, and Datone Jones Of course Belichick is always liable to trade down, especially this year where he doesn’t have many mid-round picks. 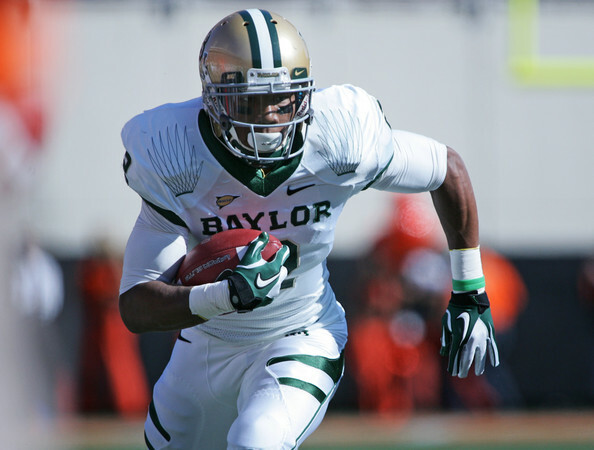 Round 2, Pick 59 – Terrance Williams, WR, Baylor The Patriots are not very deep at wide receiver. Newcomers Danny Amendola and Donald Jones are really their top targets at the position and that should make Patriots’ fans uncomfortable. The Patriots have not been good at picking receivers in the draft (see Chad Jackson) and they have been even worse at developing them after selecting them (see Taylor Price). They need someone to make big plays on offense for Brady, they need someone who will be able to create a rapport with Brady, and I truly believe that Williams is the best man for the job. I absolutely loved this guy on film. He has all the measurables you want in a receiver and he just looks great on the field. He was the deep threat for the Bears for the last couple years and he looks to continue to be that in the NFL. He is physical player who isn’tafraid to go up over the defender and make the tough catch. He runs different routes on the outside too; slants, button hooks, out and in routes make him a versatile weapon that could be dangerous in the Patriots’ offense. He is also a pretty decent red zone threat. I really like Williams, and if he is available at this spot, the Patriots should not hesitate to pounce on him. Round 3, Pick 89 – Tyrann Mathieu, DB, LSU The secondary in Foxboro is shaping up to be very interesting for the coming season. They locked up Aqib Talib for at least one more year, Alfonzo Dennard missed out on jail time (at least time that will force him to miss any games or camp), and I absolutely love the signing of Adrian Wilson at safety. Then comes the player formerly known as the honey badger. 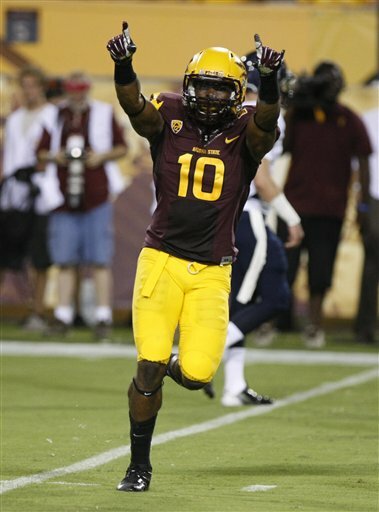 Mathieu is a bit of small player and needs to be used correctly if he is going to be successful in the NFL. What Mathieu is though, is a big time playmaker; and you can’t have too many of those on your defense. Getting him at this point of the draft also presents some solid value. Mathieu also has a bit of that versatility factor as he is a pretty prolific punt returner, and while that job is pretty much locked up in Foxboro by Julian Edelman, he tends to get hurt too often.